Fiscal documents with revenue stamps attached are not easy to expertise. In many cases, we don't know much about the period of use of particular stamps, or about the tariffs applied and to what kinds of documents - and, in particular, about the cancellations used. We do know that cancellations were often manuscript and we know that manuscript cancellations are easily faked but difficult to detect as such unless you have high-powered equipment to analyse ink. Sometimes a forger will make it easy by using Biro on a 19th century document but quite often they do go to the expense of acquiring a bottle of ink. Right now, there is a lively Alternative Investment market in Armenia with lots of people looking for old scraps of paper, preferably with old writing on them and even more preferably with dates between 1917 and 1923. To such scraps of paper, postage stamps or fiscal stamps can be added and cancelled. The result is to turn a worthless scrap of paper into something saleable on ebay for twenty bucks (or more). OK then. 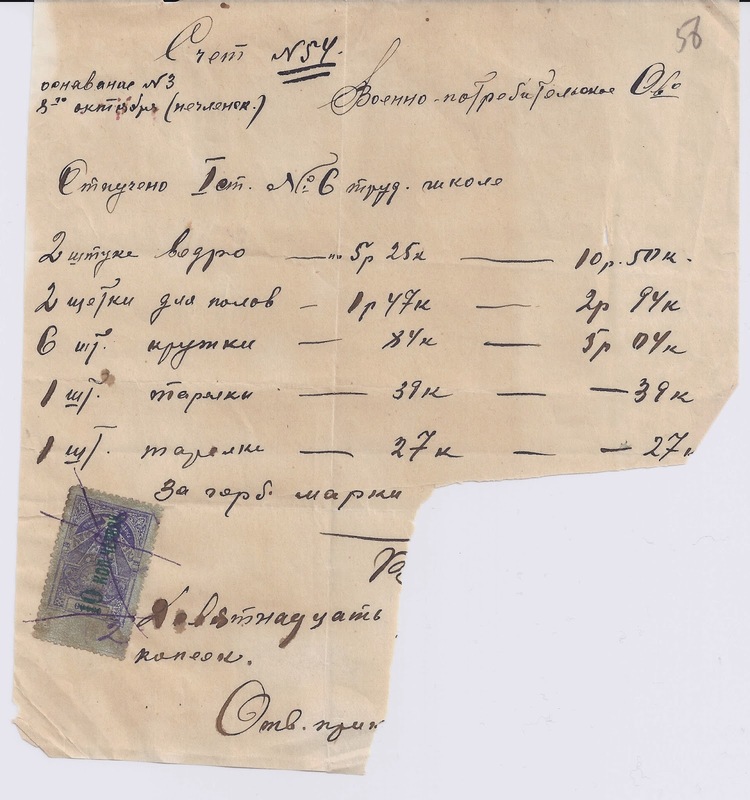 It's a receipt, written in Russian and accounting for items priced in roubles and kopecks.There is no date. 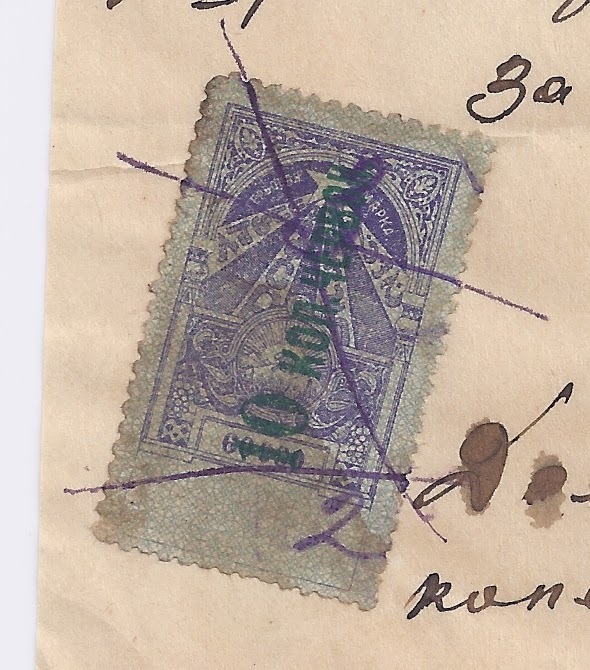 There is a 1923 Transcaucasian Federation revenue stamp at the left [ # 6 in Zakiyan's listing], tied with violet ink. The question is this: Does the stamp belong? My first question is this: How come the stamp is dirty in comparison with the surrounding piece of paper? Was a dirty stamp used? But fiscal stamps don't usually get this dirty before they are used. My second question is this: Look at the manuscript "2" at the bottom of the stamp. If you get something like this at the bottom of a fiscal stamp it's normally a date. So where's the rest of the date? Answer: on some other document to which this stamp originally belonged. If you enlarge the image above you can see that the "2" does not spread onto the document but stops at the perforation. If you wanted to pursue the question of whether the ink lines cancelling the stamp are recent or original you would probably need some equipment - enlarge the image now and it is not 100% clear what the answer to that question is. You have to ask the question: Has someone inked in lines on the paper to match original lines on the stamp or are all the lines added? Is there any other support for my conclusion that this stamp has been added (recently) to the document? Look at the bottom line of the receipt. Correct me if I am wrong, but it seems to add the cost of a fiscal stamp to the other receipted items ("Za gerb. marki" - for the fiscal stamp). But then the cost of the stamp is missing. So too is the entire bottom right of the document. Doh! On that bottom right corner, I think there was once a fiscal stamp and a date (probably not 1923) and that some collector tore off the stamp for his collection - leaving a scrap of paper.